Caring for someone else’s needs is a lot of work, and at times, a thankless job – even when it’s for someone you love. Learning the ins and outs of the various conditions your loved one may be suffering from, figuring out how to navigate Medicare and hospital paperwork, managing the physical toll, and even the financial strain is enough to make anyone second guess why they took on the job in the first place. But finding a community of people you can lean on can be a real lifesaver. A great community can connect you with others who have experienced what you’re going through. You’ll find people who can answer the questions you may be dealing with, and those you can just vent to about the rough time you’ve been having lately. They can share tips and resources, knowledge and compassion. Living in such an online world makes it easier than ever to find a group you can lean on. Message boards and forums are a great place to connect with a lot of people like you, and to get and share a lot of information in one place. So what are you waiting for? Here are some great groups to check out. Most of these allow you to poke around a bit without posting anything, which is a great way to learn a lot and also get a feel for the community. When you’re ready, share your own voice and start reaping the rewards that come with having a large group of caring people to lean on. 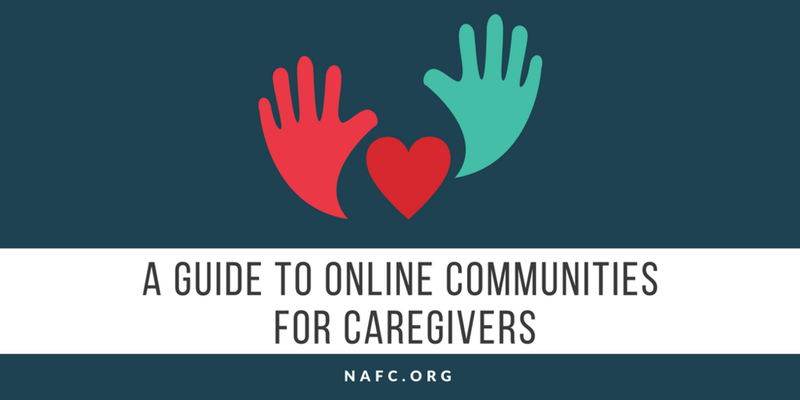 Know of some other great forums for caregivers to connect? Share them in the comments! How Can You Show Gratitude Toward Yourself And Others? It’s not something we ever want to think about, much less discuss. But we all get older, and sooner or later, there will be decisions that need to be made when it comes to how we, and our loved ones, want to be cared for toward the end of our life. Talking about dying is not fun, but it is necessary to do it ahead of time to ensure that everyone’s wishes and needs are met – especially in the event that a loved one can no longer make those wishes heard on his or her own. When talking with a parent, approach them directly, and let them know that you’d like to talk about how they’d like to be cared for as they get older. This involves asking them questions about how involved they’d like to be in their medical care (do they want their doctors to do what they think is best or do they want to have a say in every decision), how much they want their family involved, what to do in the event of life-support or a terminal illness, etc. Talking about and documenting these wishes early will help prevent confusion later on and can ensure that your parent’s end-of-life wishes are carried out the way they would like. Need some help getting things going? The Conversation Project is dedicated to helping people have discussions on end of life and has a great starter kit available on their website. Download yours here. Did Your Mom Or Grandma Talk About Bladder Health With You? Many seniors can continue to live vital and active lives well after retirement, but safety is always a concern when a senior is living alone. As our bodies age, the risk of falls, broken bones, and other injuries increases, and for some, staying in the home may not be feasible. This is especially true when the home contains stairs, clutter, or walkways that aren’t accessible to wheelchairs or walkers. That’s why it’s imperative for seniors to assess their home to see what dangers might be lurking, to repair or replace any broken appliances, and take a good look at what their needs will be in the coming years. Here are some of the best tips for senior safety while aging-in-place. If you have lived in the same home for many years, it’s possible that several updates need to be made in the kitchen and bathroom areas. Take a look at appliances and fixtures such as the stove, refrigerator, and bathtub and consider replacing worn-out technology with newer models. Many appliances now come with “smart” features--such as alarms and automatic shutoff--that would be extremely helpful for a senior. As for the bathroom, add non-slip rubber mats to the floor and tub, as well as a safety bar and shower seat. Take a look at your home through the eyes of an older version of yourself. Will you be able to climb the stairs easily, or navigate through walkways? Remove any clutter, old rugs with turned-up corners or slippery backs, and furniture that could provide a trip hazard. Add lighting to stairwells and main living areas to ensure visibility; nightlights are a wonderful tool to have in every room. It’s also a good idea to make sure bedrooms and bathrooms will be accessible from a wheelchair and that doorways are wide enough, especially in older homes. For peace of mind, it’s always nice to have door alarms or motion sensors on the property, but they can also be helpful in reminding you to lock up. Consider investing in an alarm service and having motion sensor lights installed around the perimeter, which will aid your vision at night. It’s also a good idea to make sure there are up-to-date fire extinguishers in the kitchen and in any living space where there might be candles or smoking. Install carbon monoxide and smoke alarms in living spaces. Dogs and cats can be wonderful companions, and for seniors, they can also be service animals. These animals do much more than provide loyal company; they also help lower stress levels and can be extremely helpful for individuals living with dementia or Alzheimer’s disease. Aging-in-place may seem like a big undertaking, but if you take it one step at a time and plan well, you might be able to stay in your own home for the rest of your days. About the Author: Caroline James is the co-founder of Elder Action, which aims to provide useful information to aging seniors. Is Sitting Making You Older? Being a caregiver to someone you love is complicated work – it can be both rewarding, and draining all at once. The emotional and physical demands placed on a caregiver are many. Add to that the financial strain that many caregivers face and it’s easy to see how caregivers can become a bit stressed out at times. Read below to learn our Top 8 Tips for Caregivers. Learn To Take Care Of Yourself First. Before you can even begin to care for someone else, you need to ensure that your own needs are met. Eating well, getting good sleep, and exercising regularly will help you stay healthy and energized. And don’t forget about taking regular breaks and time outs for yourself – it may seem like an extravagance, but fitting in a little alone time can do wonders for your mood. You’ll come back feeling refreshed and ready to take on the daily demands of caregiving. Medical files, legal documents, financial information – who knew that caregiving would involve so much paperwork! Get organized right from the start and create a system that will allow you to keep track of all your important records. Also, speak with your loved one and make sure that you know their wishes for end of life care and make sure you get any paperwork needed in order. There are lots of services out there that can help you manage the load of caregiving. Finding extra medical support, meal assistance, or even having a friend or family member help out for a few hours each week can help shoulder a lot of the burden of caregiving. Taking care of someone else can make your other daily chores seem harder. Outsource what you can and automate everything else. Hire a cleaning person. Sign up for a food service like Blue Apron. Have your groceries delivered or set up an auto grocery list online for things that you purchase regularly. Set up automatic bill pay for your fixed expenses. Simplifying these things can help free up some of your precious time and energy, and help keep you from becoming overwhelmed. Find Ways To Connect With Your Loved One Daily. With all the routine demands of caregiving – bathing, feeding, managing medications – it can be easy to forget one of the most important things an aging loved one needs – human connection. Don’t get so caught up in the daily demands that you forget to spend quality time with your loved one. Taking daily walks, reading or listening to audio books, playing card games, looking through old pictures or even just watching a favorite television show together can help make your loved one feel loved and connected. And telling them how much you love them will never get old. Learn About Your Loved One’s Condition. Learn as much as you can about any conditions that your loved one may be dealing with. Knowing what to expect and how to handle it can make a world of difference. Caregiving can sometimes be a thankless job, and it’s easy to see how frustrations can morph into feelings of bitterness or resentment toward your loved one. But the saying “Treat others how you would like to be treated” applies in this situation as well. Think about how you would like to be cared for and try your best to understand your loved ones feelings and what they are going through. Caring for a senior--whether it’s a loved one or a client--can be an overwhelming task at times. It’s a stressful job, to say the least, and it can take a toll on your mood, your mental and emotional health, and your physical well-being. If you’re caring for a loved one, there’s added pressure due to your ties, and if you’re caring for a client, it’s important to make sure they’re well taken care of and that their family is satisfied with your work. "There's a continuum of ways people become caregivers. Often a loved one suffers a stroke, accident or fall or a chronic condition worsens, and people are thrust into a situation. But few plan for it as well as they could," says director of operations for the Family Caregiver Alliance: National Center on Caregiving Leah Eskenazi. Here are some simple things you can do to make sure you give the most compassionate care possible to the senior in your life. Whether you’re caring for a family member or a client, it’s important to have boundaries. Both of you will benefit from setting some rules, such as what you can and can’t do physically, what your schedule will be like, and what you expect from both the senior and their family members. This can help keep your relationship respectful and will ensure you don’t experience burnout. If you’re caring for a loved one and most or all of the responsibility is falling on your shoulders, it’s time to ask for help. Keep in mind that you are just one person and it’s impossible to do it all alone without experiencing exhaustion and stress; don’t allow guilt to stand in the way of asking for assistance. Let your family members know that you need someone else to step up and help, and make an effort to support one another as much as possible. There are several groups around the country that will assist seniors who are ill or unable to leave their home; church groups, senior centers, and caregiver programs are all great resources to access when you need a break. Some of these will provide rides to doctor appointments, help with grocery shopping or bringing meals in, or even do light housework. When you need to take a breather, let one of these groups come and help you out. If you’re going to be caring for a loved one in your own home, you’ll need to prepare the environment first. This can be very involved, so do some research or seek the guidance of professionals. If you’re caring for a parent or other loved one, it may become necessary for you to become power of attorney at some point. Discuss the possibilities with your family and find out what your loved one wants when it comes to hospital stays; seek the counsel of a lawyer to draft a living will. This will be invaluable should the unexpected occur. Question: I’ve had a hard time discussing my father’s incontinence with him - he is so embarrassed by it and never wants to address it. How can I bring the subject up without making him uncomfortable? Answer: Caring for a parent with incontinence can be very hard. After all, you’ve both played opposite roles for most of your life, with your parent providing most of the care for you. When a parent becomes dependent on their child, and especially when they are experiencing something like incontinence, it can make them feel ashamed and embarrassed. They may try to hard to hide their incontinence, or brush off mention of it and try to avoid the subject all together. Start slowly. Discuss their health and condition and then talk to them about some of the incontinence symptoms you’ve witnessed. Be patient - they may have some reservations in discussing their problem with you at first. But give them some time - once they feel comfortable, they’ll open up to you and you’ll be able to work on a management plan together. If you are a new caregiver to a patient with incontinence or your family member just recently developed bladder and bowel problems, you’ll want to consider keeping supplies at the ready to help you address this condition. In many cases, your family member or patient won’t be entirely comfortable with their situation and may attempt to thwart help or assistance. If that engagement leads to leaks or uncomfortable situations, it’s your job to be prepared and help them clean up in a dignified way. Rug pads: Individuals with nocturia or overactive bladder are very susceptible to falling from incontinence in an effort to get to the restroom quickly. Make sure the rugs in the house and bathroom are padded underneath to avoid slippage. Absorbent products: Many times, leakage or bladder spasms occur when the individual is in transfer, or is moving from place to place. Be at the ready to respond to these needs with an appropriate product. Water: Dehydration can be a catalyst for frequent urination and in some cases, urinary tract infections. Avoid your patient or family member experiencing either by encouraging and modeling enough water intake. Click here for guides on how to drink more water. Protective Bedding: Waterproof mattress covers, bed pads, and extra sheets can all make a huge difference when cleaning up a wet bed. Bladder or Bowel Diary: Managing physical and dietary responses to bladder and bowel concerns is a proven way to help manage incontinence. Help your loved one or patient track their urination, bowel movements, and intake of food and water by keeping the diaries available and ready for updates. Download the diaries here. We hope these tips can help you be the best assistant in their journey. Are there any tools you’ve already found helpful to have? The holidays are upon us (already!) and while this is often a time of joy and thankfulness, it can also be a time of stress if you are hosting festivities at your home or having overnight guests. This is even more so if you have a guest who experiences incontinence. We’ve compiled some tips below to help you deal with the added tension of having visitors with incontinence over the holidays. An old manager that I had used to recite this saying to me before every sales meeting: “Fail to prepare, prepare to fail.” I have found this to be true in many aspects of life, and preparing for a visitor – especially one that may suffer from incontinence – is no exception. Find out what they like to eat (or, maybe even more importantly, what they don’t like to eat) and have healthy snacks on hand that won’t aggravate their bladder/bowel. Buy a plastic or waterproof mattress cover to ensure that if an accident happens, no serious damage is done. Have extra bedding and towels available to make any cleanup needed easy, and prepare the guest bathroom with appropriate cleaning supplies – flushable wipes, soap, air freshener, etc. Ensuring that the appropriate tools are ready before an accident happens makes it so much easier to take care of when something unexpected occurs. 2. Make things easy for them. Make things as simple as possible for your guest. Give them a tour of the house when they arrive so they know where all the restrooms are. For overnight guests, try to have them sleep in a room that is close to a bathroom. Place extra supplies in their room so that they have easy access to them when they need them. If it makes sense for their visit, provide them with an itinerary of what they can expect when they visit – places you will go, company you will be having, etc. Knowing what to expect ahead of time may give them more peace of mind when traveling to and staying in an unfamiliar place. 3. Be understanding if an accident happens. This is probably the most important tip that we can offer to you. While we know that it can be frustrating to make extra stops to use the restroom, clean up messes, and change bedding, you can be sure that the embarrassment that your guest feels from these things far outweighs any inconvenience they may cause you. No one wants to be incontinent and making someone feel bad or ashamed of something they cannot control will put a damper on the whole trip. Be understanding with your guests, and if an accident does happen, don’t act frustrated or make a big deal about it. Help them as much as they will allow, and leave it at that. They will greatly appreciate your discretion and kindness toward them. Do you have any tips for caring for a visitor with incontinence over the holidays? Share them with us in the comments below! The holidays are around the corner. These times are meant to be joyous and filled with opportunities to create long-lasting memories. However, for the person caring for someone with incontinence, it can be challenging and even overwhelming to balance all of the responsibilities needed to manage incontinence while preparing for holiday festivities. By planning ahead, caregivers and their loved ones can certainly find ways to get the most enjoyment out of the holiday season. Establishing a good incontinence management plan and a solid routine for care is essential to keeping happy, healthy, and organized. By having a good plan, you will be better at providing care to your loved one and still have the time and energy to care for yourself and enjoy the people and festivities surrounding you. Here are some tips to make your loved one feel comfortable. 1. Be prepared and involve your loved one in the preparation. If you have the opportunity to take your loved one out, make sure to take them to the bathroom. Always pack extra incontinence products with you and even a change of clothes. It is important to reassure your loved one that you are prepared. Often the one suffering from incontinence can become distressed, depressed, or nervous about leaving for fear of becoming embarrassed or uncomfortable. Some may even feel as though they are burdening the one who is caring for them. Be sure to have a conversation prior to leaving to boost their confidence. This will ensure that they enjoy the outing as much as you will. 2. Evaluate the travel plan and map out as much as possible in advance. Remember that your loved one will not know where public restrooms are. If you plan on taking your loved one to another persons home, be sure to locate the bathrooms immediately and make sure they are barrier free, easy to access, and safe. 3. Make sure there is a quiet place to retreat to. Large crowds and noise can lead to anxiety, irritability, and exhaustion. Frequent breaks away from all of the chaos can help alleviate this. Plan for quiet time, rest, or even a nap. If your loved one starts to appear anxious, take them to the quiet area before the anxiety escalates. Monitor facial expressions and tone of voice throughout the day. Fidgeting, swaying, raising their voice, and restlessness are all signs of agitation. Whatever you do, do not become frustrated. Keep your cool and a good sense of humor. 4. Make sure your loved one participates in as many activities as possible. Remember, you are not just caring for your loved one, you are making memories. Share photos, tell stories, sing songs. If your loved one is not capable of participating in any of those activities, try reading a holiday story with family and friends. This will be relaxing while keeping them engaged. When the time comes to provide personal care to your loved one, be discreet to avoid any embarrassment. Don’t announce to everyone that you are taking your loved one to the bathroom. Make sure to discuss with friends and family members prior to arrival or pull them aside shortly after and explain what is going on and what you will be doing as to avoid any questions, comments, or concerns in the presence of your loved one. 6. Be prepared for meal time. It is extremely important to provide dignified, discreet care. Be sure to take your loved one to the bathroom before dinner and do any incontinence product changes, personal care, or clothing changes. This will ensure that everyone gets to sit together and enjoy the meal and any discussion taking place. Having to excuse yourself from the table to take your loved one to the bathroom will only increase their anxiety and level of embarrassment. Additional help from another friend or family member can relieve the caregiving responsibilities throughout the holidays. If you do have someone helping you, be sure to notify the person you are caring for to avoid any confusion. Make sure they are equipped to provide the same care as you would. If you do not have anyone available to help you provide personal care for your loved one, perhaps they could help out in other ways. 8. Take the time to listen to your loved one. Remember that someone suffering from incontinence can often feel lonely, depressed, and may even feel as though they have lost their independence. The holidays can escalate these feelings. Make sure to listen and keep an open line of communication with your loved one. Understand and take time to validate their feelings and initiate conversations about all of the positive things that are taking place around them. It is not uncommon for your loved one to feel as though they have lost their independence. Be sure to reinforce that you understand and that you will be there to help them. It's important to care for yourself during this time too. Below are some tips to help you help yourself. 1. Be sure to take time for yourself. How you manage your health can affect your loved ones. Be sure to get plenty of rest. Find an online support group that specializes in incontinence. These groups can be of tremendous help to you. Caring for a loved one can be stressful. But just keeping an upbeat and steady attitude can go a long way in making the holidays a relaxing and enjoyable time for everyone. Try to find ways to ease some of your tension, like squeezing in a couple of workouts, or finding some time to practice meditation.